Should the broad markets hold up, the biotechs look poised as one of the more promising sectors for a long-side swing trade. XBI is the 1x ETF while those looking to play a short-term pop could use LABU (3x bullish biotech ETF) with an short trade in LABD (3x bearish biotech sector) being a good option for those looking to swing trade what could be a multi-week rally in the sector, again, should the broad markets confirm. Personally, I remain net short US equities, primarily via the Q’s but have that position partially hedged with a short in LABD. I should also add that I can see & actually slightly favor one additional marginal thrust lower in XBI to the 47.56ish level, which is decent support on the daily chart (about 2% below where XBI is currently trading). 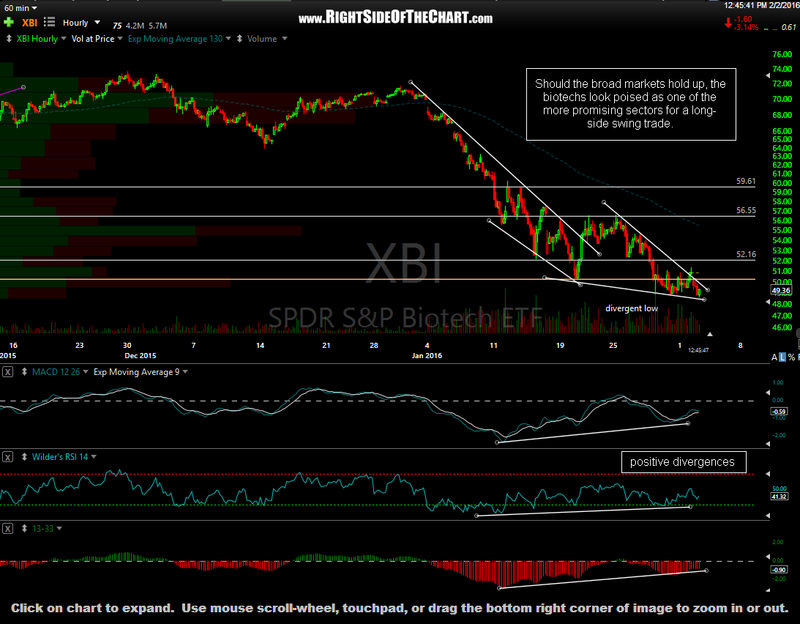 note: Although I will add XBI to the Long Trade Setups category for now, these are unofficial trade ideas at this time. As such, suggested stops and profit targets are not listed (although I have a few key resistance levels on this 60-minute chart) and there may or may not be any follow-up commentary to the biotechs. Just passing along a potential trade setup for those interested in some long-side trade ideas at this time. Also note that the LABU official short trade that was initiated in this post back on August 7th remains an Active Short Trade with the final target still TBD as the original & current intent was to position as a bear market “short & hold” trend trade. As evidence of the vicious price decay suffered by the leveraged ETF that track very volatile sectors such as the biotechs & gold mining stocks, LABU has lost about 85% of it’s value since the short entry on August 7th & I would expect that number to approach the 100% mark before the bear market in the biotech sector has run it’s full course.